Bring fresh excitement to the front of your home with a simple yet striking makeover. Most folks don’t think about replacing a garage door until they absolutely have to, waiting until it gets damaged or dingy, or stops working altogether. But design-savvy homeowners know the difference that a new garage door makes in an exterior face-lift. For starters, this prominent feature can span more than 30 percent of the facade—and that’s a third of your total curb appeal. But installing a new garage door is much more than a one-step makeover. It also can prove to be a best-bang-for-your-buck home improvement that increases the home’s resale value, since most potential buyers judge a home by its exterior. Whether you’d like to bring a cohesive quality to your home’s exterior, better accent an existing architectural feature, or totally change things up, turn first to your garage door. 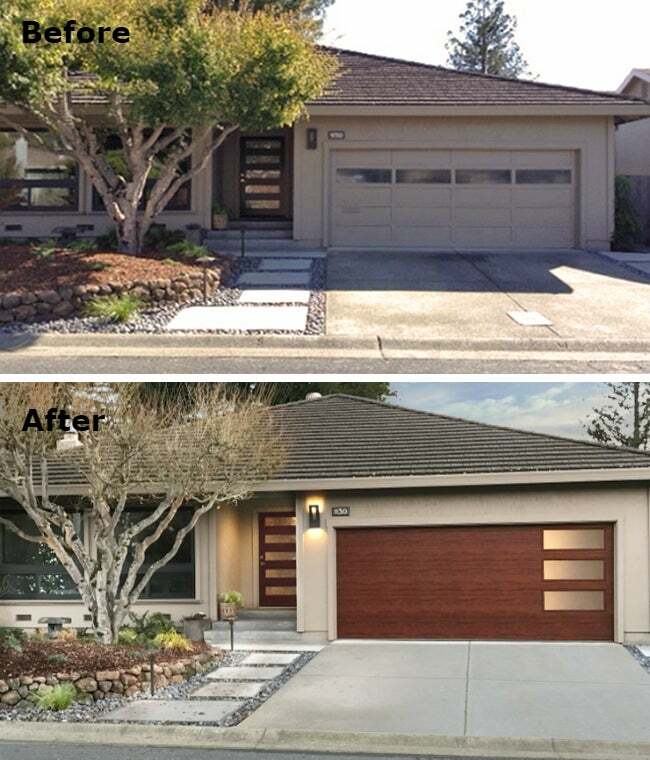 A quick trip through three transformations brought to you by the garage door experts at Clopay will be sure to open the door to inspiration! You’ve probably put a lot of thought into the front door of your home because you’re aware that it speaks to everyone who comes in, or even passes by. By that logic, your garage door, which is even larger and more prominent, should receive the same attention, if not more. If you already love your front door, consider letting it set the tone for a new garage door. When you can use a similar design for both doors, the decision is so much easier, and the two doors complement each another and establish harmony. That’s the approach used in the makeover of this Northern California exterior. A selection from Clopay’s Modern Steel™ Collection was a close style match to both the existing front door and the home’s contemporary, midcentury architecture. Available in either a flush or grooved steel panel design, the Modern Steel Collection offers 13 factory finish options and a wide variety of glass and window choices, including insulated and frosted, and is the perfect accent for a dramatic, contemporary front door. Have a different style home? Visit clopaydoor.com for collections designed with your home’s architecture in mind. You may think that a bland afterthought of a garage door would disappear among the more prominent features of a home’s exterior. In reality, the door detracts from the overall appearance. On this house, the beige garage doors blend into the siding, but it doesn’t minimize the fact that they were the first thing you saw when you pulled into the driveway. The rich stain finish on the newly upgraded Clopay Gallery Collection garage doors added the much-needed warmth and contrast and brought the entire house to the forefront. The Gallery Collection kicks the iconic raised-panel steel garage door up a notch with vintage details like a grooved panel design, unique finishes (like Ultra-Grain®, Clopay’s exclusive faux wood-grain paint finish shown here), and optional decorative windows—ideal for a Craftsman charmer like this! Why fade away when you can stand out? A home built a half-century ago or more can often see several transfers of ownership and a host of accompanying renovations or design changes—not all of which will preserve its original character. This particular Tudor, for example, was outfitted with a rolling steel door in the 1970s that actually diminished the rest of its architectural style until its next owners came along. 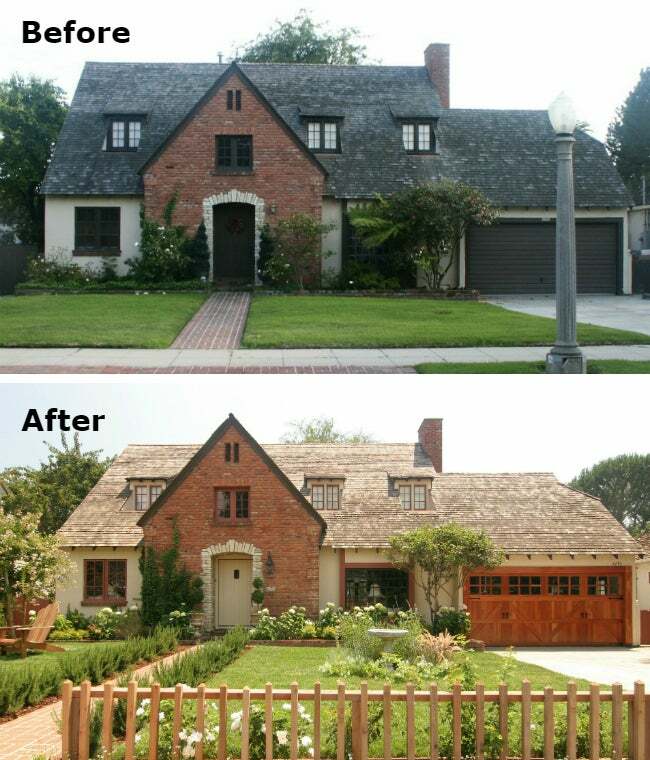 Their curb appeal makeover prioritized renewing the building’s charm starting with the eyesore of a garage door. 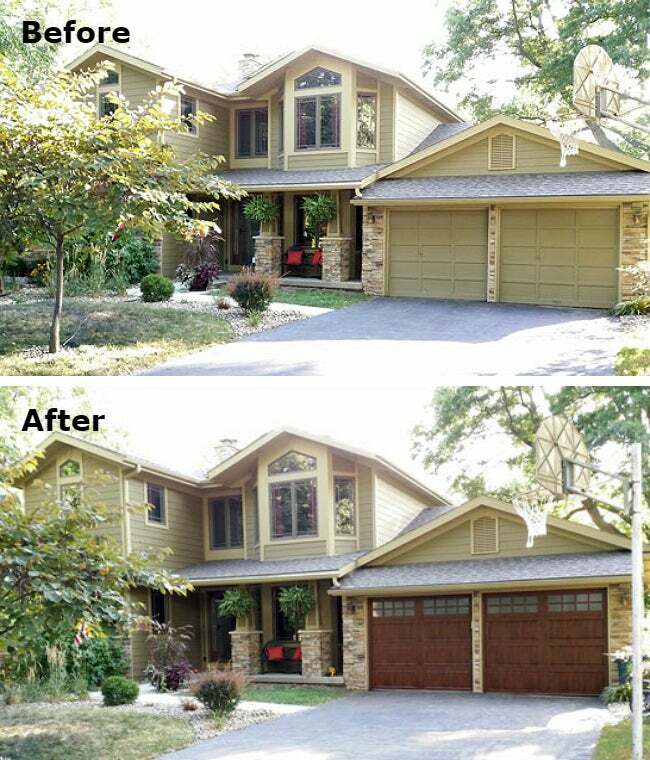 Combined with additional updates, a new garage door can change the look of the entire house! 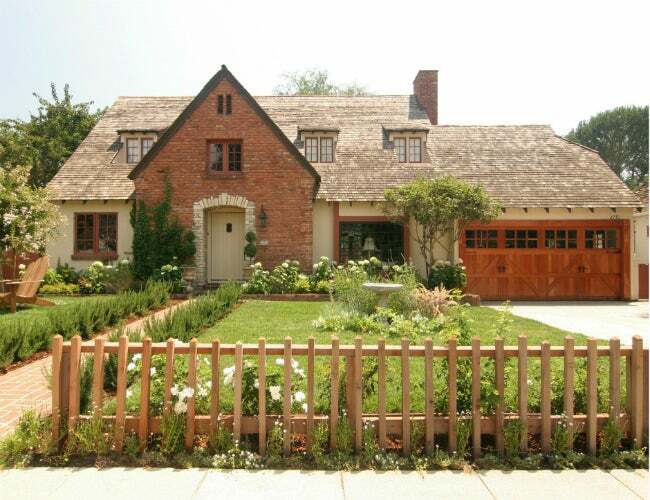 Here, the freshly painted windows and front entrance of this stately Tudor—as well as the delightful front garden and picket fence—are beautifully served by a stained redwood carriage-house garage door from the Clopay Reserve Wood Collection. These garage doors are handcrafted in four- or five-layer construction (in the material of your choice, including Knotty Alder, Spanish Cedar, White Oak, Ironwood, and African Mahogany), and insulated with polystyrene for better energy efficiency. If you can dream it, Clopay can design and build it to your specifications for distinctive style, quality, security, and—of course—curb appeal that wows! This article has been brought to you by Clopay. Its facts and opinions are those of BobVila.com.